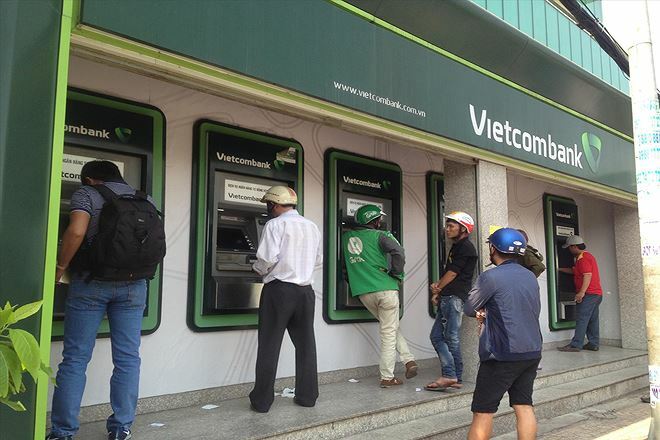 No concrete solutions have been found for out-of-service ATMs as Tet nears as the demand for cash surges in HCM City. According to Sacombank, they have 1,072 ATMs and assigned employees to monitor the machines to refill the money. However, they have advised customers to bank branches when possible. The representative of Eximbank also said that they were still monitoring the ATMs before, during and after the Tet holiday. Vietcombank also announced that the ATM transactions increased four-fold compared to usual. When there's only VND100,000 (USD4.31) in the machines, the withdrawal limit will be lowered from VND5m to VND3.5m. It will further be reduced to VND1,750,000 if only VND50,000 banknotes are left. However, many people are complaining about problems with ATMs. The workers at Tan Binh Industrial Zone said on January 29 that they had to change ATMs five to seven times to gather enough money. According to the guards at the nearby bank, the ATMs would often return cards. Withdrawing money from ATMs is a gamble now. "The machines looked normal and there's no out of service notice. But when I tried to withdraw money, it kept returning my card," said Hien, a worker in Tan Binh Industrial Zone. Tran Thi Hien, a worker from Tan Tao Industrial Zone, said she needed to withdraw VND10m but one ATM machine was broken and one was too crowded. Withdrawing money from other bank ATMs means lower withdrawal limits and higher fees. Such a situation is very common in the suburbs since ATMs and bank offices are sparse in Binh Tan, Binh Chanh and Cu Chi districts. Tran Van Ninh from Ga Vap District said he started withdrawing money early over several days in order to deal with the ATM problem.